I'm a Windows user, and want to use Falcon - but did it have GUI abilities? Yes, there is a GTK binding. I tried this, and found errors in this. Maybe they were my fault, but they could not be resolved via the falcon message board. Anyway, by chance I came across gtk-server, which works by running gtk as a parallel process. Your program sends strings of text to gtk-server, and gets back messages as strings of text. This seems to work with Falcon, after coding a little function to read and send data streams to a process. Below is a trivial text editor for Windows - it is not for serious work, more a proof of concept. To run it, you need falcon of course, and also the gtk-server software, which installs under Windows very simply (I'm not sure about the ease of Linux installing). 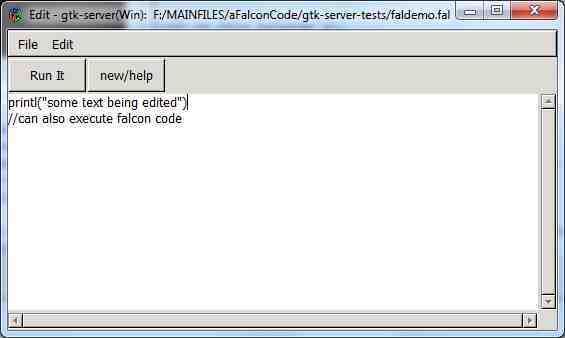 As a bonus, there is a button which runs ths falcon interpreter on the code you are editing. The site also has docs and examples. If you can't be bothered to do 1 and 2 above, delete the 'set_homogenous' line below - it still runs. file = GTK("gtk_menu_item_new_with_label File")          //name at top of menu - not really a menu item! GTK("gtk_menu_shell_append "+fileMenu + " " + openMenu);           // low level actual item! saveAsMenu = GTK("gtk_menu_item_new_with_label \"Save As Menu item\" ")  // menu item! GTK("gtk_menu_shell_append "+fileMenu + " " + saveAsMenu)                //low level actual item! saveMenu = GTK("gtk_menu_item_new_with_label \"Save  Menu item\" ")   // menu item! GTK("gtk_menu_shell_append "+fileMenu + " " + saveMenu)               //low level actual item! edit = GTK("gtk_menu_item_new_with_label Edit")             //name at top of menu - not a menu item! copyMenu = GTK("gtk_menu_item_new_with_label \"copy Menu item\" ") // menu item! GTK("gtk_menu_shell_append "+editMenu + " " + copyMenu)            // low level actual item! GTK( "gtk_widget_set_size_request "+buttonRun+" 77 33" )       //needed? //nb the C description in gtk docs used constants: GTK_STOCK_CANCEL and OPEN. f.readText(inText)    //must be a way to avoid specifying max size? return inText   //strbuff to str value - ok? //The text passed to gtkserver must be one string, surrounded by "
//does the  \"  pair. So I have to replace them. The following does this. It is a bit crude, and I think regexps would be better! //It has not been thoroughly tested. //quote stuff  "  and   \"
inText1=strReplace(inText1, "6BACK", "\\\\\\" )      // single  \  -do first? //quote stuff "  and  \"
inText1=strReplace(inText1, "3BSQ", "\\\"")          // normal " works-but need to isolate from handling a\", by magic string? allText=GTK("gtk_text_buffer_get_text "+buffer +" "+startiter+" "+enditer+" 0")  // eol, " are escaped"
//am not doing \b \t \r   seems ok!